Arthouse darling Albert Serra is back with one of France’s great leading men in tow. Watching a man slowly die has never been so much fun. Comic, tragic and boasting one hell of a kiss-off quip. The sight of the legendary French actor Jean-Pierre Leaud puckering his lips, attempting to produce saliva in his dried-out gullet, really is something to behold. He resembles a gone-to-seed hound dog attempting to retain the vapours of life force, but perhaps knows that he’s not long for this Earth. Cocky spaniard Albert Serra returns with the wonderful The Death of Louis XIV and, to an almost comic degree, it abides by the promise of that morose title. 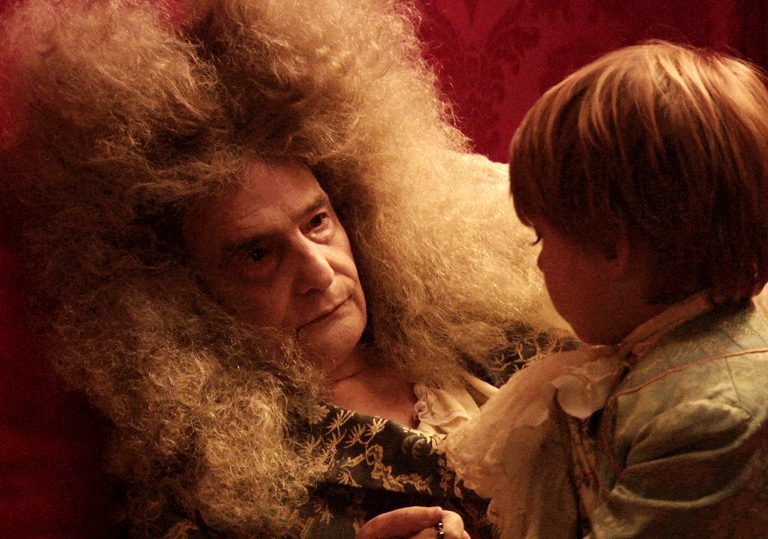 Leaud himself dons a series of ever-more-outlandish and gravity defying poodle wigs as the venerated “Sun King”, waiting in his velvet-draped chambers to be enveloped by the infinite. But there is the suggestion that he is so accepting of his status as a walking god – a status bolstered by a surrounding army of fawning dandies – that he somehow believes he’ll transcend the fate of man and live on forever. Despite all the beliefs, rituals and superstitions, the film concedes that there is, in the end, nothing we can do to stall the inevitable. When the crumbling meat sack we refer to as our body decides that it’s time to head for the exit sign, then it’s time. This is a humanist work, looking at death as the one thing that aligns us all. The film is hushed and delicate, observing as the king’s valets ponder the best course of action to ensure his continued comfort. Serra holds the takes to the point of pain. He emphasises the indecision and the confusion, as the king decides to join a meeting, is heaved into his wheelchair, and then heaved straight back into bed. It transforms stuffy costume drama into strange situationist comedy while delicately knocking an icon of history from his vaunted pedestal. Leaud’s finely nuanced performance is miraculous and possibly one of his most self-reflexive (which is saying something). And don’t you dare leave the cinema before the sublime closing line, which is as archly cynical as it is wholly tragic.